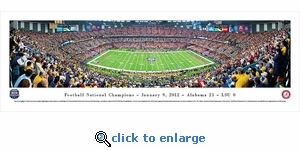 This panorama highlights the excitement of one of the most anticipated college football games of the year between two worthy SEC opponents, the University of Alabama Crimson Tide and the Louisiana State University Football Tigers, as they battle for the coveted award at the 2012 BCS National Championship Game. In the end, it was the onslaught of the Crimson Tide's bruising running attack that achieved national championship status with a final score of Alabama 21, LSU 0. This is Alabama's second trip to the national championship game and their second win. The BCS National Championship Game is the final bowl game of the season, played between the two highest-ranked teams in the BCS standings.